The speed of the game of hockey today has dictated that only having one set of eyes call all penalties just isn't feasible anymore for games played at the sport's highest level. The four-man officiating system is universally accepted as the best officiating system for hockey at its upper levels. College, most professional leagues, the NHL, and IIHF (the International Ice Hockey Federation, governing body for the Olympics, among other things) have all adopted the four-man system. That being said, it is not a system without flaws. A play in the Minnesota Wild / Dallas Stars game on Saturday, January 18th provided a specific example where the four-man system can be particularly vulnerable. Play starts out with Dallas defenseman Trevor Daley skating the puck out of his defensive zone. At this point the lead ref starts retreating to the Minnesota zone. Daley is approached by a fore-checking Kyle Brodziak. At about the top of the faceoff circle, Daley drops the puck back to Alex Goligoski just above the faceoff dot. Brodziak peels off, and takes a couple of strides backwards through the neutral zone. Trailing ref Jean Hebert stays behind the play. His responsibility is to monitor all players as they head up the ice. He is the last man to move up ice. Goligoski slides the puck to Benn at his own blue line, and Benn skates through the neutral zone. Lead ref Francois St. Laurent is responsible for being the first man up the ice, and is now approaching the faceoff dot in the Minnesota zone. Halfway between the red line and his attacking blue line, Benn is approached by the on-rushing Matt Cooke. Anticipating contact with the puck carrier Benn, Cooke appears to try to slow down or stop suddenly as he closes in. Benn slides the puck into the Wild zone and then immediately extends his left arm and elbow outward and upward, contacting Cooke in the face and head area, and sending him reeling backwards to the ice. At the point of contact Hebert (trail ref) is probably in the vicinity of the Dallas blue line, while lead ref St. Laurent is nearing the goal line deep in the Wild zone. No penalty is called as a result of the contact initiated by Benn on Cooke. This situation illustrates one of the biggest complaints about the four-man officiating system- the neutral zone can be particularly susceptible to a lack of visual coverage by the referees. While there are indeed 4 officials working every NHL game, there are different responsibilities divvied up between the referees and linesmen. Among referees responsibilities are calling penalties, awarding goals & assists, ensuring no player changes happen when teams ice the puck, and general supervision of the game. Linesmen are primarily responsible for determining off-side and icing calls. 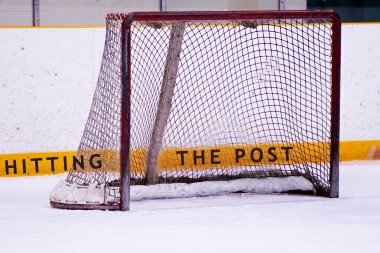 The only time a linesman shall stop play due to a penalty infraction is due to 1) too many men on the ice, 2) articles thrown on the ice from the vicinity of the players’ bench or penalty bench, or 3) delaying the game by deliberately displacing the goal post. A linesman may not stop play but instead can report to the referee at the next stoppage of play his version of a potential rules infraction that he believes is worthy of a bench minor, major, misconduct, game misconduct, or penalty shot. Also, any injury potential penalty that occurs outside of the referee’s field of vision may be reported to the referee. The referee may, at his discretion, assess a penalty in such instances. At the first whistle after the Benn hit on Cooke, linesmen Mark Wheler and Bryan Pancich race in to intervene before a scuffle ensues. As Pancich is keeping Cooke in check, and it becomes clear no physical confrontations are going to take place, referee St. Laurent and linesman Wheler have a quick exchange. I can only speculate that St. Laurent asked Wheler if he saw anything about the Benn hit that was worthy of a penalty. While they kept this chat brief, I can guarantee the whole crew talked about this hit at length after the game in the sanctuary of the dressing room. As Cooke was able to get up immediately and jump back into play, seemingly uninjured, any potential penalty call on this play would have been up to the two referees. I am quite certain this was a non-call due to the positioning of the referees, and that they did not get a good look at the hit from their vantage point. I can’t for one second fathom that an NHL-caliber referee with a good vantage point and sightline would have seen this play clearly, and ruled it a “clean” play without penalizing him. This play serves as a prime example that the four-man officiating system, while generally a very effective one, is not without its flaws.